Introduction: This is a case report of a 61 y/o male with a gangliocytic paraganglioma with focal carcinoid features of the appendix. A literature search was done and this appears to be the second reported case of gangliocytic paraganglioma of the appendix in the modern literature. A previous similar case report in 1999 was described in Amsterdam by Eeden et al. Methods: This is a case report of a 61 year old male who presented to St. Francis Medical Center with classical signs and symptoms of acute appendicitis. In addition, prior to an evaluation by a surgeon the pt had a CT scan of the abdomen showing acute appendicitis with local inflammation. Results: The patient was taken to the operating room for a laparoscopic appendectomy. Upon insertion of the laparoscope there was a small amount of purulence in the RLQ and pelvis. Introperatively he was found to have an acute suppurative, ulcerating and focally necrotic appendix with focal perforation. In the resected specimen in addition to appendicitis with focal perforation there was a 1.0 x 0.8 x 0.7 cm nodular mass at the distal tip of the appendix. The tumor showed various histopathologic patterns with some cells resembling a carcinoid tumor and other cells that resembled ganglion cells. Immunohistochemical stains were done showing ganglion cells, carcinoid tumor-like cells and neural like cells. A diagnosis of gangliocytic paraganglioma was made. Conclusions: Gangliocytic paragangliomas are unusual neoplasms that may be identified anywhere within the gastrointestinal tract, but predominate in the in the periampullary region of the duodenum. The pathognomonic features of this neoplasm are the identification of three distinct cellular elements: spindle cells, epithelial cells, and ganglion cells. These tumors are considered benign, yet occasionally metastasize to regional lymph nodes, as well as to distant organs. . Due to rarity of the disease there is no consensus on the adjuvant treatment even though nearly 5% of the lesions demonstrate the malignant potential. Long term survival is common with appropriate resection. We report a case of a 61 year old male who presented with a classical picture for acute appendicitis and was found to have a 1 cm gangliocytic paraganglioma tumor in the tip of the appendix. While reports of gangliocytic paraganglioma tumor associated with the duodenum have the potential for metastasis, we believe that resection of this incidental tumor during laparoscopic appendectomy is curative. 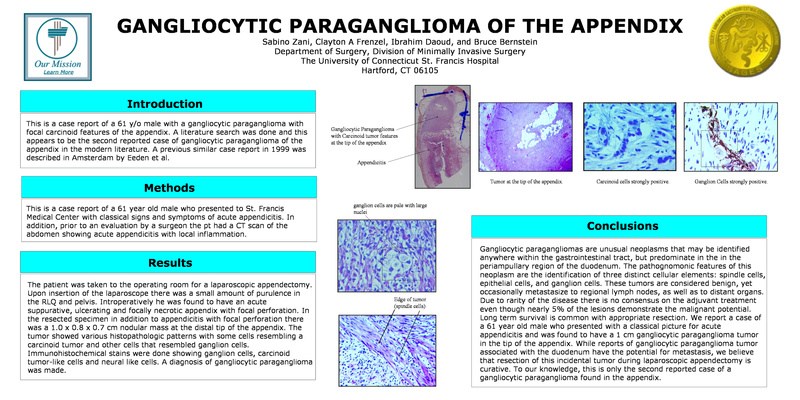 To our knowledge, this is only the second reported case of a gangliocytic paraganglioma found in the appendix.